It consists of breaking up the soil with a high-pressure jet in a predrilled borehole and mixing the loosened soil with a cement grout to form soil create. Single fluid: This is simplest due to exclusive reliance on the high velocity of Jetstream to cut, remove and mix in-situ soil. Double fluid: This is the simultaneous injection of high velocity grout stream within a cone of compressed air. The double fluid system is capable of creating a larger column than the single fluid system. 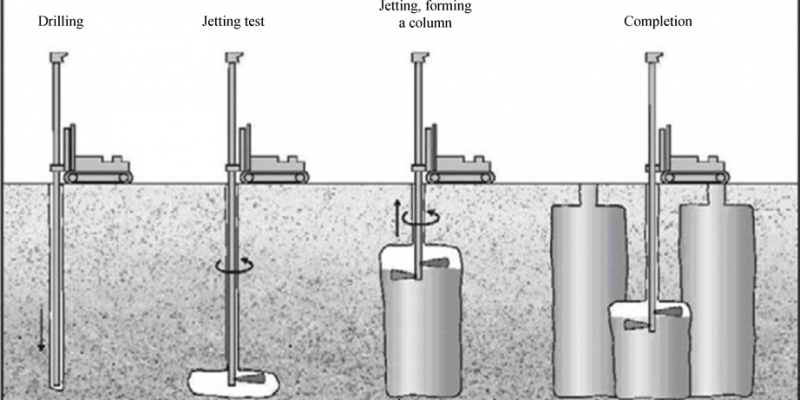 Triple fluid: This is the most complicated jet grouting system due to the simultaneous injection of three different fluids, air, water, and grout. The triple fluid system can create the largest diameter of column among the three types.